I am loving playing around with stone fruits, liquor and jam. What to add with what? What fruit goes with what liquor? I always get raves about my brandied fig jam, so when the Washington State Fruit Commission made me a 'CANbassador' and shipped me boxes of prunes and nectarines: I looked in my cupboards for inspiration. 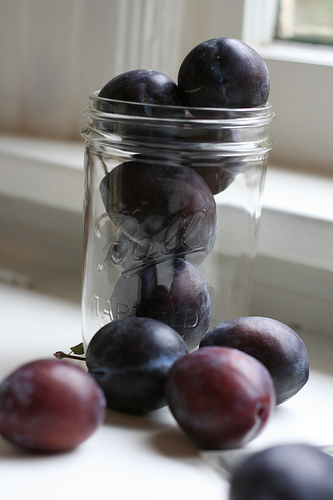 Plums are divine in and of themselves but to pump up the flavor I added rum, cardamom and lemon juice. Yes, the lemon juice IS used for upping the acid for safe canning BUT it is also good to know: lemon juice is to canning what salt is to cooking. You add it so the existing flavors SHINE. Like editing an already good photo to make it great: all the elements are there, you just need to tweak it to make it the best version it can be. And therefore: we add lemon juice. This just might be my new favorite jam. Rum Plum Cardamom Jam. Say that 10 times. Now, drink some rum and say it another 10 times. Yeah: I didn't think so. Bring plums, rum, cardamom and sugar to a boil. Keep at high simmer for 20-30 minutes, stirring frequently. Test via the spoon method [for thickness]: have 3 spoons already cold in freezer, drop 1-2 tsp of jam on spoon and let cool to room temp (touch bottom of spoon; when it is no longer warm, it is 'room temp'). Hold spoon handle upright and examine jam. Is it loose and drippy or one consolidated glob? If it is the glob, whip that pan off the stove: you are done. If it is still 'loose' then cook jam another 2-3 minutes and test again. STIR IN LEMON JUICE to taste; add 1/4 cup, then taste jam. Is there a hint of lemon? Good. If not, add another 1-3 Tablespoons. While still hot, seal using small-batch, water bath method: fill jars within 1/2 - 1/4 inch of rim, wipe rims with sanitary/clean, dampened towel and apply new lids and rings. Boil in water bath 10 minutes. Cool on towel on counter for 24 hours. You know the drill.